The Go Getter portable sound system combines value and quality. This system as designed to be budget friendly but still offers the sound, quality, and versatility of all Anchor Audio portable sound systems. It is ideal for both voice and background music, indoor and outdoor settings, and is battery powered – making it truly versatile. The Go Getter is lightweight and easy to transport and set up on a speaker stand. Its easy to use back panel allows anyone and everyone to operate the portable sound system – just grab it and go! Use the Go Getter for school functions, corporate training, fitness centers, houses of worship, and more! 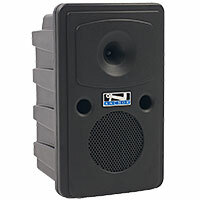 When used with any powered Go Getter Portable Sound System, reach crowds of 1000+ !